How do you follow a movie about a gargantuan killer shark? For Jon and Erich Hoeber, the answer is bringing a beloved cartoon character back to the big screen. According to Deadline, the two screenwriters who co-wrote The Meg will pen a new Mighty Mouse film for Paramount. Paramount has been trying to get a new Mighty Mouse film off the ground since at least 2004. The studio was originally planning to release the film through its Nickelodeon Movies imprint, but there’s no mention of this in the latest report. Deadline describes the upcoming movie as a “hybrid” that will utilize elements of both live-action and animation. 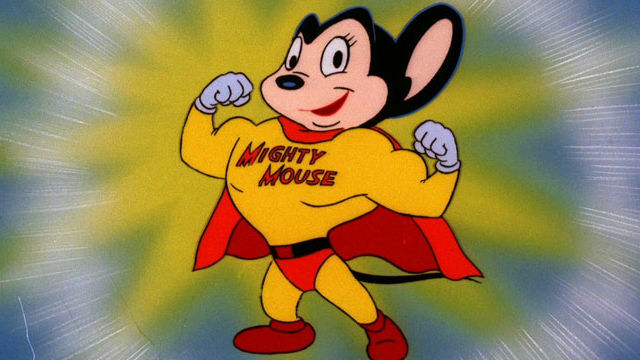 Mighty Mouse made his first appearance in a theatrical animated short film in 1942. Creator Paul Terry envisioned him as a parody of Superman and gave him a grab-bag of similar powers, including flight, super strength, and x-ray vision. The character began headlining in his own series, Mighty Mouse Playhouse, which aired from 1955 until 1966. That series was well-known for its catchy theme song, which was famously used by Andy Kaufman in his comedy routines. After this, the rodent superhero starred in two additional animated series in the ’70s and ’80s. Aside from The Meg, the Hoeber brothers also scripted both RED films as well as 2012’s ill-fated Battleship. Their most recent effort, My Spy, stars Dave Bautista and hits theaters later this year. In 2015, it was reported that they were collaborating with NBC on a RED TV series, but it’s not clear if that’s still in the works. Are you excited for Mighty Mouse to return to movie theaters? Who would you cast to voice the title character? Tell us your thoughts in the comment section below!